Flete class is year 1 and year 2. We are taught by Mrs Edworthy Monday to Thursday and by Mrs Eames on Fridays. Flete class have shared and guided reading each day. To support your child's reading skill and to adopt a love of reading please help by reading with your child daily. Please sign their planner each time they have read at home. Thank you for your ongoing support with this. Flete class have leap most mornings and also have a PE session on Monday afternoon. Please ensure your child's kit is named and on their peg throughout the week. Year 2 have weekly maths, spelling and comprehension homework. Year 1 have weekly phonic and maths homework. Design and Technology puppet making May 2018 Check out our puppets inspired by the Story 'Fatou Fetch the Water'. For the summer term, we shall be learning all about Africa. The children will be learning interesting facts about the continent and will immerse themselves in the story 'Fatou Fetch the water!" by Neil Griffiths. Next the children will be involved in a Geometry and art project which will be about textiles and collage. They will create their own puppets with costumes inspired by African patterns and colour. We look forward to sharing our fabulous work on here soon. In the second half term we will be following a project called 'Under the canopy.' In this project the children will be growing their own cress and creating experiments. They will be learning about plants and trees and visiting Longtimber woods. Children will also learn about food webs and have the opportunity to produce the information they have learnt in their own non fiction reports. 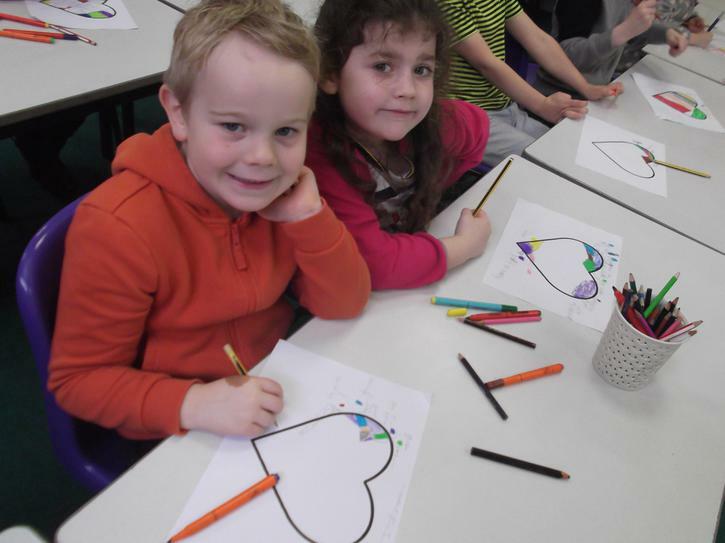 On the 12th March The Erme Primary School hosted their very first Well being Day which had been planned and organised by their very proactive School Council. 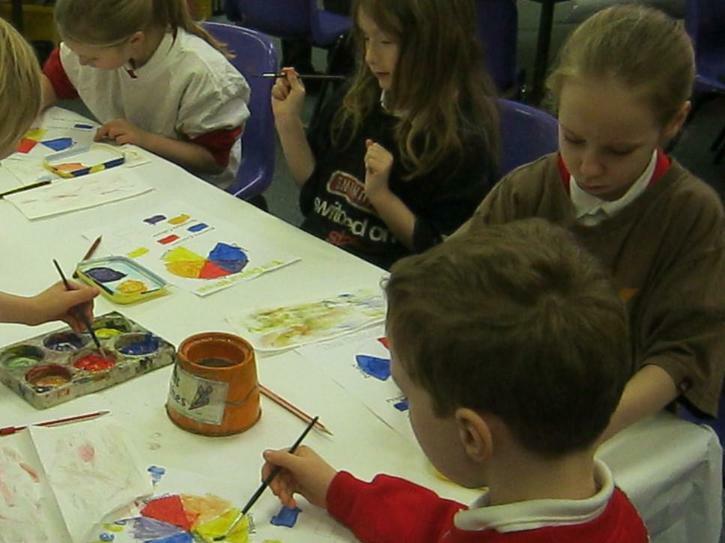 The children enjoyed a range of activities throughout the day to help promote self efficacy and resilience such as art therapy, goals and aspiration discussions. Many outside agencies local to Ivybridge also came in to deliver workshops to the children in aid of this special day. 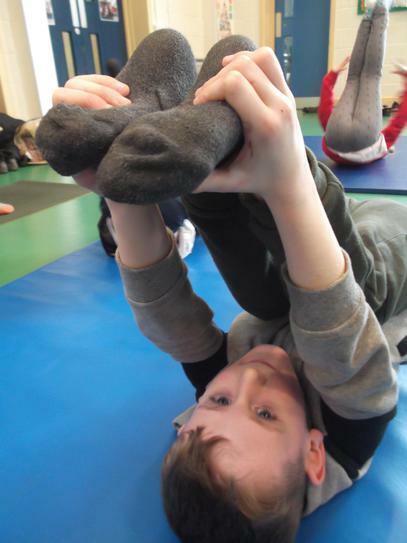 Key Stage 2 children were involved in workshops put on by a charity called Emotional Logic. Emotional Logic (EL) was developed in the 1990s by a Devon doctor as a lifelong learning, conversational version of systemic family therapy. EL is not counselling or therapy, but a taught, conversation based skill that helps people build deeper, healthier relationships. The Emotional Logic Centre is a Devon charity led by GP’s and education professionals. 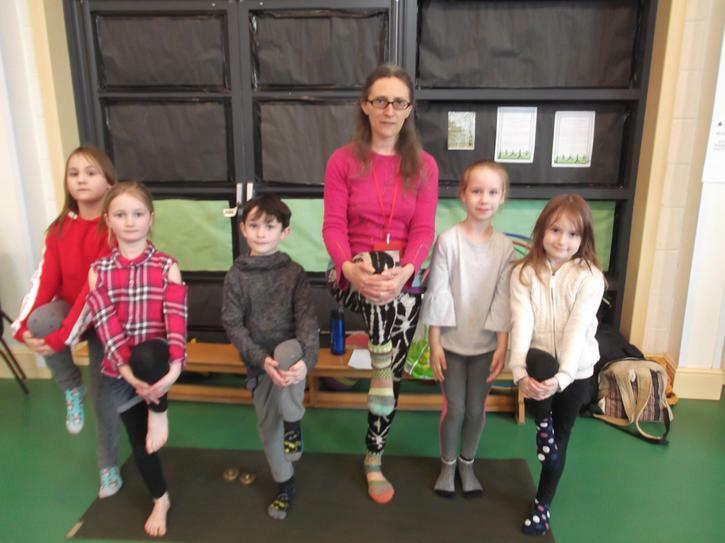 Children from yF to y3 also enjoyed some Yoga sessions with links to nature which gave them time to relax and think about their breathing and posture. Liz Turner www.intoyogaandnature.co.uk was brilliant in her delivery and the children loved her journey to the rainforest theme. Lots of sports activities also went on throughout the day for the children. Ivybridge Community College arrived with y12 students who put on a range of teambuilding and multi skills for the children. 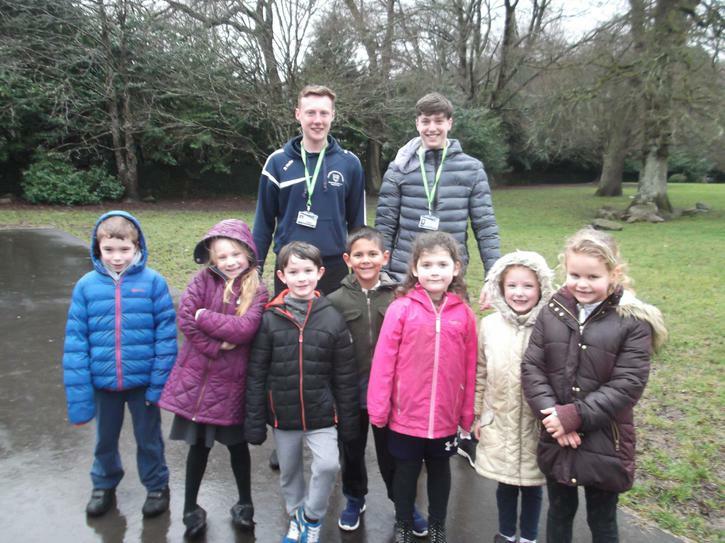 The children absolutely loved working with these year 12 sport B tech students who were certainly very inspirational in their approach and care of our pupils. 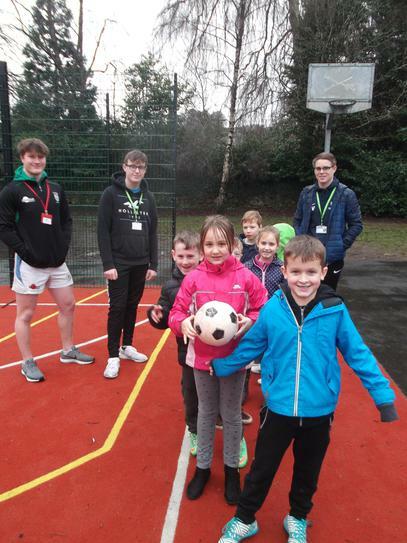 Also massive thanks to Andrew Potter from Sports way Management who set up some volleyball sessions which was a sport many children had never played before. His coaches were brilliant at motivating the children to try out new skills and techniques. The day would not have been complete without a visit from Caroline Atkins and her therapy pat dog , Flossie. Flossie and her owner are volunteers from the dogs charity [www.petsastherapy.org]. Flossie stole the hearts of all our children and staff and was the sweetest visitor we have ever had. Matthew said, "Emotional Logic helped me learn about the life cycle of our emotions." 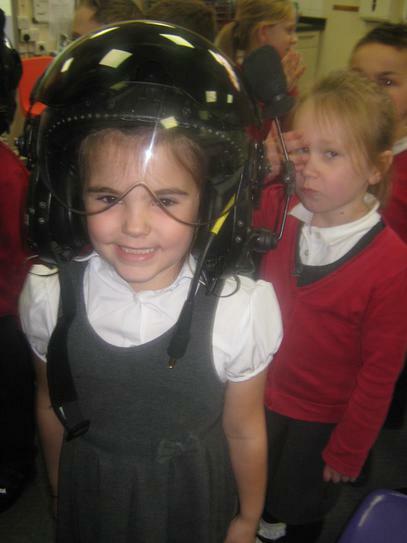 Amelia said, I loved playing games with the big children from the College. Amy said, "Emotional Logic helped give us a plan of what to do if we feel angry. Alesha said, "The Volleyball session was the best because it gave me the confidence to try something new." 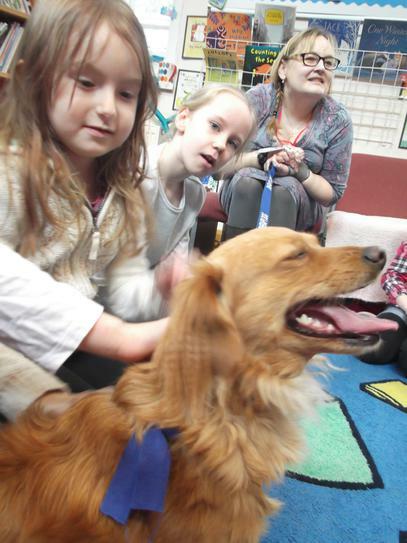 Riley said, I loved meeting Flossie because she was so smooth to pat and she was really cute." The day has been a huge success and it was great to get so many people involved from our community. We are very grateful to them for giving up their time to promote the well being of our children and we look forward to creating more opportunities like this in the future. Well done to y1 and y2 who took part in an inter house Multi skill event yesterday. They all worked brilliantly in their teams and showed excellent sportsmanship. All teams scored points into the thousands which was an amazing achievement. The winning teams that will go on to compete against Shaugh Prior and Cornwood. The children of The Erme Primary School have been involved in a two day Art programme where they have experienced creating natural art form interwoven with clay. 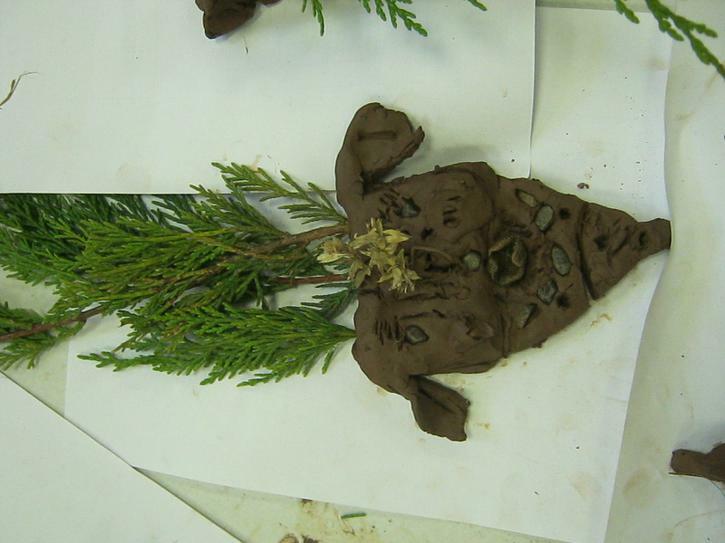 The children were given time to research natural materials and then use this to create their own mythical creature in 3d form. The sculptures were also influenced by the artist Andy Goldsworthy. 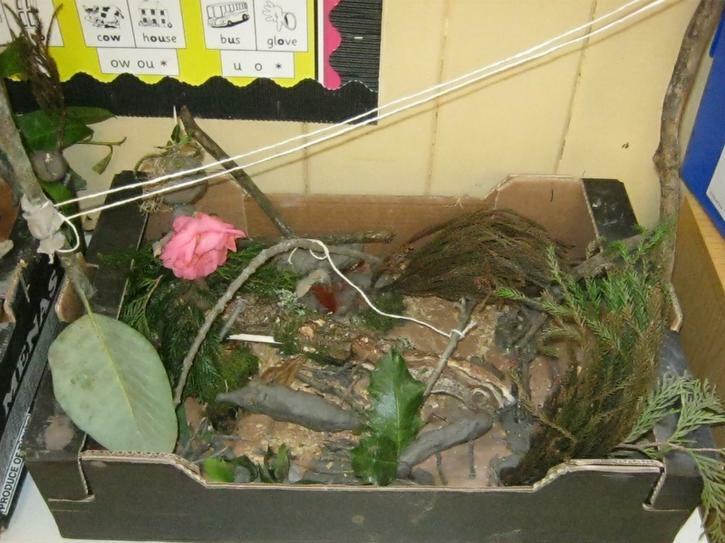 The children enjoyed using Victoria Park to inspire their creations and collect natural materials. We are so lucky to have such a fantastic outdoor space for the children right beside our school. On the second day, the children designed their own patterns after investigating plants and animals from across the world. 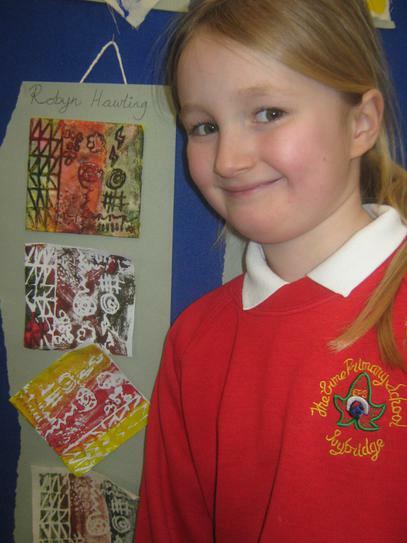 They then created their own tiles which they used to print on a range of fabrics and paper. The quality of the work throughout the school showed amazing talent and commitment to such a brilliant project. Parents were also able to come and see their child's work an art exhibition within each classroom. The curriculum at The Erme is designed so that all curriculum subjects are linked within 'learning projects' which in turn enthuses children's writing and mathematical skills. We were very impressed with the results and look forward to more days in the future like this. 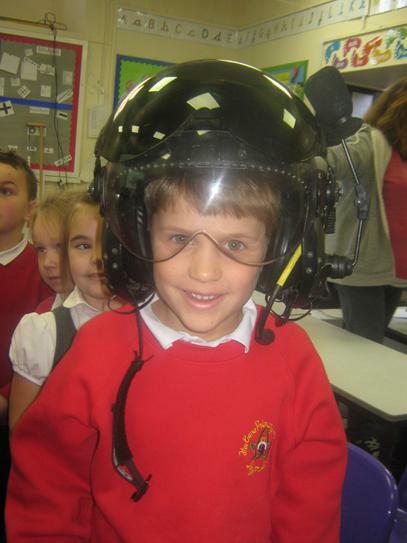 Children in KS1 are currently doing a project called, 'Come fly with me'. 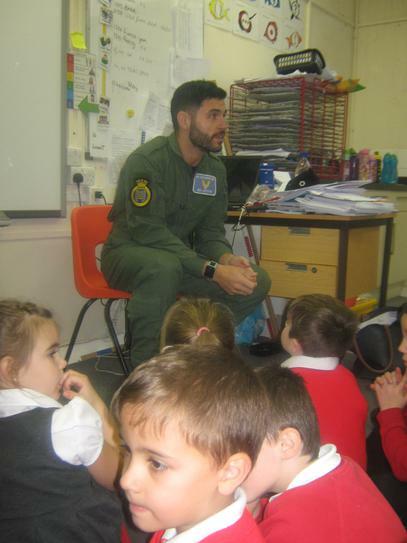 The project was kick started with a visit from Ben Jackson an air crewman from the Royal Navy based in Culdrose. 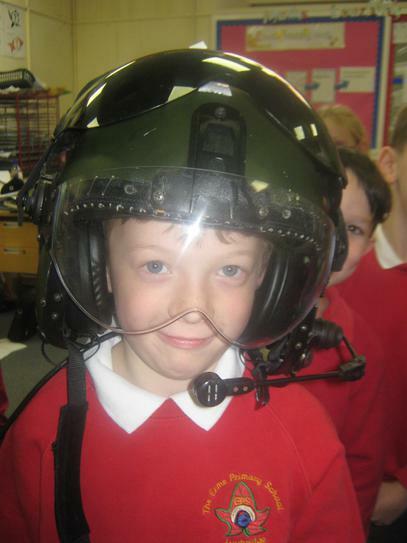 The children absolutely loved his presentation about his role on the Merlin helicopter. 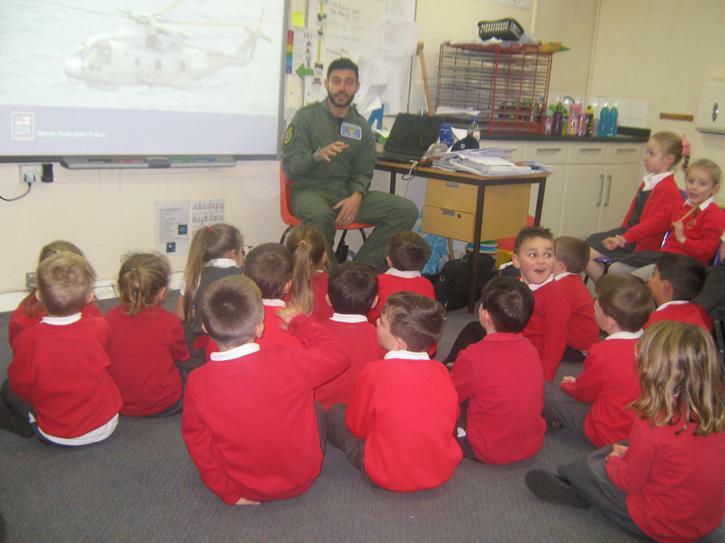 The children were particularly fascinated by the helicopter's strength and aircrew man's skill to save lives and lift people to safety. Special thanks goes to Mrs Shergold for helping to organise this exciting event.